TOKYO — At times, it seemed as if he'd go on hitting forever. Now 45, Ichiro Suzuki left the Tokyo Dome field in the eighth inning, waving goodbye to the packed crowd amid hugs from Seattle Mariners teammates in a three-minute walk that signalled to all his monumental run was over. To chants of "Ichiro, Ichiro, Ichiro" he was greeted at the dugout — and later in the dugout — by emotional embraces from teammates. 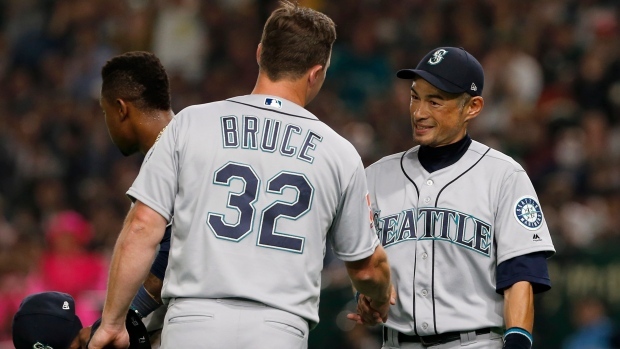 Yet when Mariners teammate Dee Gordon bowed, Ichiro broke into a laugh — like, "not necessary, bro." Oakland players stood solemnly and watched camera flashes and iPhones catch the historic scene. All over the stadium signs read: "Ichiro we love you" and "Ichiro is Life." Fans wore his famous No. 51 in all shades, colours and from all eras. Ichiro was 0 for 5 in the two regular-season games against the A's in Tokyo, leaving him with 3,089 hits in 19 seasons — a sure Hall of Fame resume. He had 1,278 before that over nine years in Japan, making him baseball's all-time hits leader. "I had 3,089 hits in America," he said. "But I think my wife — who always makes me rice balls before games — said she made 2,800 rice balls. So I wish I could have played long enough so she could have hit 3,000 as well."